Image caption Last month, drivers working for Deliveroo and UberEats were among five people injured by moped riders in north London. 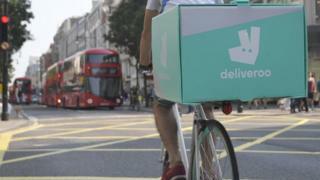 The food delivery company Deliveroo is introducing safety measures to try to protect its riders from violence. It follows acid attacks in London last month, where the victims included riders delivering by bike or moped. Since then, over 70 Deliveroo riders have said they did not want to complete a delivery because of safety fears. Among the measures being introduced are a new app feature that allows riders to raise security concerns, plus a trial of helmet cameras. Last month, two riders working for Deliveroo and UberEats were among five people injured within 90 minutes in north London by moped riders who threw acid in their faces. Deliveroo drivers are all self-employed so are not entitled to sick pay if they get attacked. They also use their own bikes and mopeds to deliver. The company says it has upgraded its app for its riders, allowing them to raise safety concerns about specific delivery addresses. These will then be shared with the company's headquarters and local authorities. It is also conducting a trial with helmet-mounted cameras to allow riders to gather evidence, and to pass on information to the police. The trial is taking place in Hackney, east London, which has become a trouble spot for riders. Deliveroo is also hiring 50 new staff who will have a focus on rider safety. Delivery rider Jabed Hussein was the first victim in the series of acid attacks last month. He was working for delivery company UberEats. He told the BBC's Victoria Derbyshire programme: "It was like getting fire on my face, I was screaming on the street. "This shouldn't be a job where your life should be put at risk. "Drivers I know are now clocking off at 22:00, it's too dangerous after then. "Most of them won't work after this, whereas we used to work until 01:00. "Now, I feel I'm working in some sort of jungle, like anything can eat me, I'm not safe." Deliveroo managing director Dan Warne said: "The safety of our riders is the most important thing to us, and it's our responsibility as a company to step up our efforts so they can feel safe all of the time."